Import Item List (products, services or both) - How can we help? How to import an item list in Sleek Bill? In your Dashboard, go to Items on the right hand side menu. In the new window, in the upper right hand corner there’s an Import button. Click on Import, and a window will pop up. One that says "Download Sample" which you should have a look at, to make sure your list has the same format (to ensure it uploads properly into Sleek Bill Online). The other one that says "Import". After you have made sure that you list is in the same format as the sample file, upload it through this button. Are you importing from Sleek Bill Desktop? 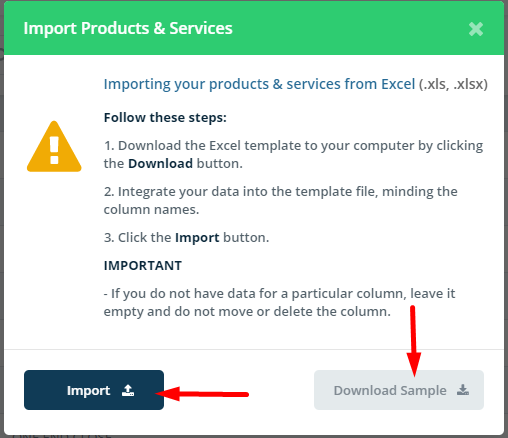 Save your file and use it when you want to Import your list here.